1. Make a schedule…and use it! Click here for our printable infographic for your workspace! Going beyond these sites if your time allows would be engaging with your customers on YouTube 1x/month, newsletter updates 1x/month and press releases 1x/quarter. 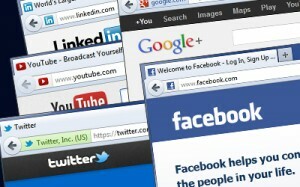 The two most important changes in social media has been Google+ and Pinterest. A Google+ page for your business is important because it affects your search engine ratings. Pinterest is important because it is now the third largest social media site. Considering Pinterest is well worth your time. Make sure the topics are relevant to where you are posting and that the tone matches. For example, fun posts should be used on Facebook and Twitter, while LinkedIn and blogs should be more serious and content-heavy. 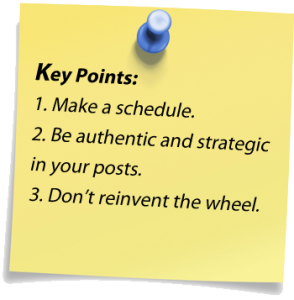 You can also kill two birds with one stone by using the same informational piece on both your blog and LinkedIn. Providing useful and shareable content will allow you and your company to gain the reputation as the leader in the industry. On the other hand, your posts on Twitter, Facebook, and Google+ can showcase the personality of the company and can really get customers excited about your product or service. Paul Chaney has a great metaphor for this—LinkedIn is your business suit, Facebook is business casual look, and Twitter is your cocktail hour. Make sure that you are on the social media sites that your customers are on so that your schedule works for you and you are spending your time where it makes the most sense. Always remember your goals for customer engagement because that will help drive where you spend your time, too. 3. Don’t reinvent the wheel. Great tools and resources are available and some of them are free or low-cost. Resources like HootSuite, Wildfire App, or Seesmic will allow you to create and schedule posts to multiple social media sites and allow you to track the results. Completely and utterly overwhelmed? Here’s a shameless plug—have us handle your social media marketing for you! Before you start, I recommend doing some research and reading just as you did before you started your company. Socialnomics by Erik Qualman is a great read if you are still not convinced that social media is extremely influential to our economy. The Digital Handshake by Paul Chaney and Word of Mouth Marketing by Andy Sernovitz are great how-to books with tips like the ones above and more. Other great reads are The Zen of Social Media Marketing by Shama Hyder Kabani and Groundswell by Li & Bernoff. And, finally, it’s essential to follow the 80/20 rule–80% of your posts should be conversation/engagement/content/participation while only 20% of your posts should be about promotions or deals. Good luck and let me know how you spent your 15 minutes today! 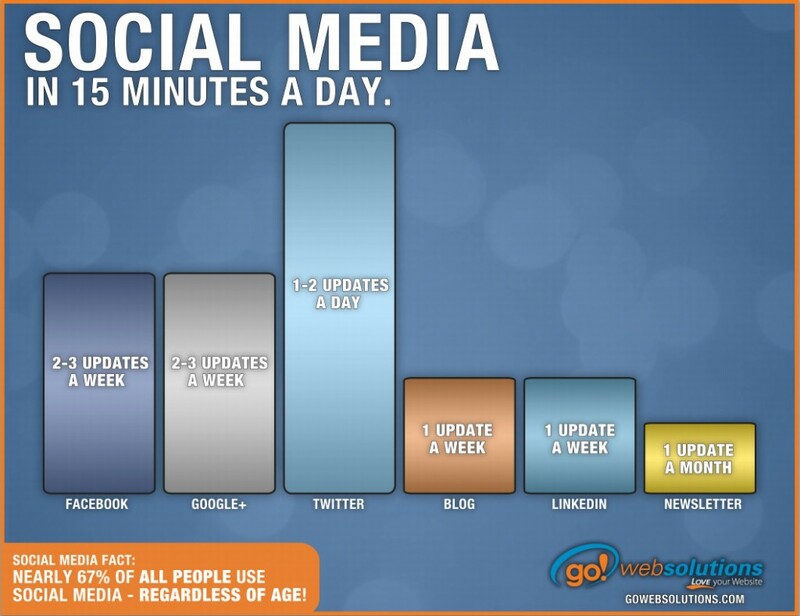 *Reference: Hubspot’s “100 Awesome Marketing Stats Charts & Graphics” 2012. Glad you liked it Beth! Good luck with your campaign.